well i’ve been seeing online alot of crochet project’s about cup hugs, cup cozies so i started doing one and it was to big for my cup so i went looking around the house for some different ways i can use this. 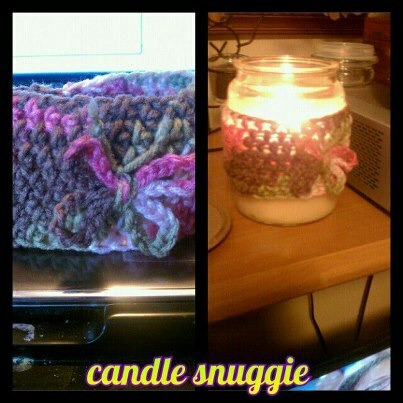 and so i stuck it on one of my Yankee candles and it was perfect and gives it a cute look. I also was thinking you could put it on a med size jar fill it with beads or plant stones and put your crochet hooks in there would be cute too . So let me know what you all think.